The Virginia State Bar is currently seeking applications for the boards and committees that oversee the VSB, the self-governing professional regulation entity for lawyers in the commonwealth. There are three ways you can be of service. Click on the links below for more information. President-elect Marni Byrum is soliciting applications for special and standing committees – due February 15. The committees include budget and finance, legal ethics, professionalism, technology and the practice of law, and several others. The Standing Committee on Lawyer Discipline seeks applicants for disciplinary district committee vacancies – due February 28. These local committees review complaints about lawyers and investigate claims within their districts. The bar’s Nominating Committee will choose candidates for the Clients’ Protection Fund Board, the Judicial Candidate Evaluation Committee, and the executive committee of Bar Council – applications due March 29. Terms begin in 2019, and applicants must submit a résumé and brief statement of interest for each candidacy. You are welcome to contact Karen Gould to talk about your best opportunity to serve. Additionally, elections for Bar Council, the VSB's governing body, are coming up in April -- for terms beginning in July. Find out what circuits have vacancies and learn how to get on the ballot. General information about Bar Service Opportunities here. 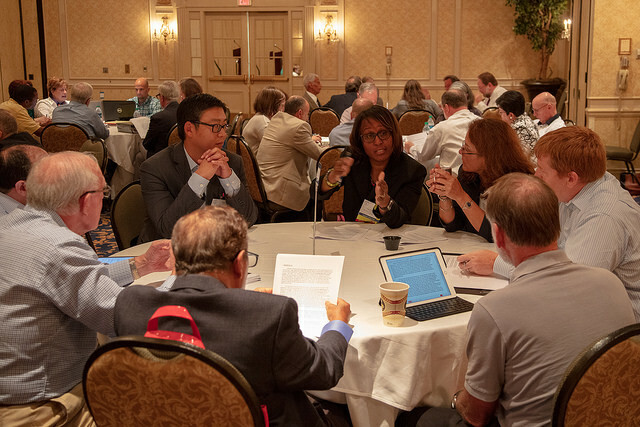 photo: Participants in the disciplinary system attend breakout sessions at the disciplinary conference in July 2018.